This most certainly is real life, but we'd forgive you for thinking it was just fantasy. Entertainment Weekly has released the first look at Mr. Robot star Rami Malek gussied up as legendary Queen frontman Freddie Mercury in Bohemian Rhapsody. Directed by Bryan Singer, the film chronicles the rock band from 1970, when Mercury joined forces with lead guitarist Brian May and drummer Roger Taylor, through to Queen's performance at Live Aid in 1985, just six years before Mercury died from complications due to AIDS. 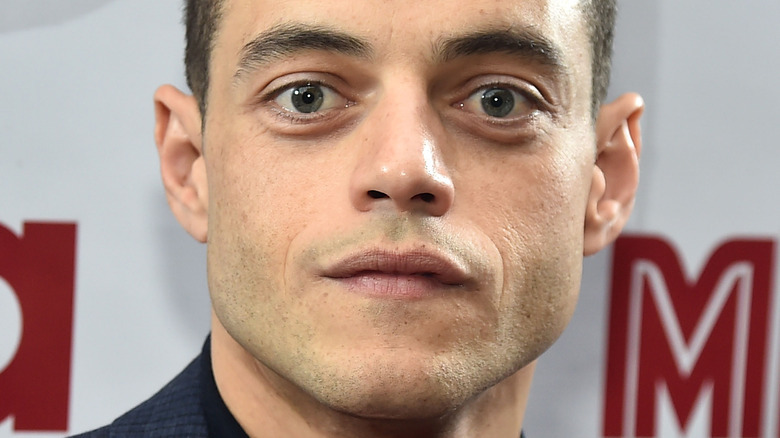 The weight of capturing Mercury's ineffable essence—from his angular face to his superbly dramatic physicality—isn't lost on Malek, and by the looks of the exclusive snap, he seems to have the exterior down pat. Malek is seen striking a pose instantly recognizable as one of Mercury's signature own: his head turned to one side, cheek facing the crowd, his thumb tucked underneath the clasp of his belt. The actor also channels Mercury's look from the 1985 global-concert event, sporting his iconic thick mustache, a white "wife-beater" tank top, cropped black hair, light-wash denim jeans, and a studded arm band around his bicep. You can take a look at the full photo at the bottom of his article. Speaking to EW, Malek recalled the gratifying experience of being in the Mercury hair and makeup. "When you're able to open your eyes and see a different person staring back at you in the mirror, it's a very affirming moment," he said. The actor added that resembling the revered musician in real life "only adds to the only adds to the level of confidence that one would need to play Freddie Mercury." But another crucial part of Malek's performance as Mercury is his voice. Mirroring the singer's four-octave range is no easy feat, especially for someone who isn't a singer by trade. 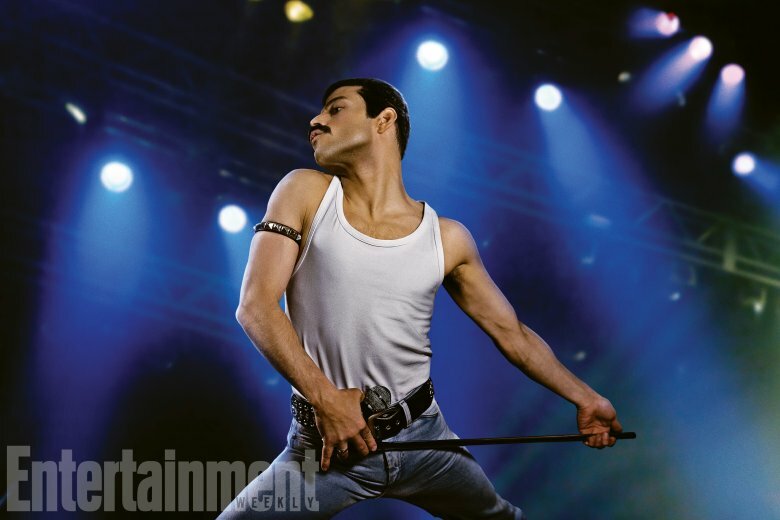 According to the outlet, sections of the film that feature singing will make use of either Malek's own voice or recordings of Mercury, with a sound-alike singer filling in the gaps. "We're going to use Freddie as much as possible and use myself as much as possible," Malek explained. "I'm in Abbey Road [Studios] right now if that should say anything to you. I'm not working on my acting." In a separate interview, Malek stated that telling the story of Mercury and of Queen has been an incredible opportunity for him. Everyday [I've immersed myself in the world of Freddie Mercury] and it never feels like it's enough because those guys, each one of them, is this incredible artist on their own. Together, collectively, it is a phenomenon. Things like that don't happen. When they would lay tracks the tape became clear because they were over dubbing things, they were coming up with new ideas all the time," the actor said. The upcoming film also stars Joe Mazzello as bass guitarist John "Deacy" Deacon, Ben Hardy as Roger Taylor, and Gwimlym Lee as Brian May. Bohemian Rhapsody is set for release on December 25, 2018, one of the many movies that will blow you away next year.